Unfortunately ,the picture is neither fake nor photoshopped. 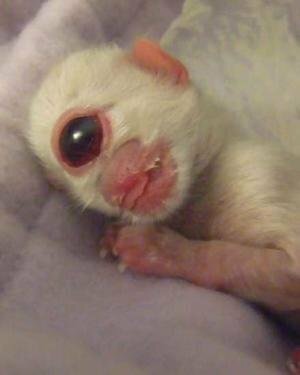 This post is about the true and sad story of Cy, a poor kitten born with holoprosencephaly. Cy, short for Cyclopes, was born with only one eye and no nose, as shown in the photo taken and provided by its owner in Redmond, Oregon, on Wednesday, Dec. 28, 2005. Cy was a ragdoll breed kitten that died soon after its birth. Cy also had a sibling which was born normal and healthy. At first, many thought that Cy's story was a hoax, circulating from one email address to the other. However, a vet later examined its corpse and concluded that the story of Cy was real. After its death, the corpse of Cy was sold to creationist and Lost World Museum owner, John Adolfi. The kitten's carcass is preserved in alcohol and toured around the U.S. The owner of the kitten ,Traci Allen, said she sold Cy's remains to Adolfi because she found Adolfi to be "a genuine and sincere" guy. She also said that she had previously turned down other offers, including one from "Ripley's Believe It or Not!". Reportedly, she rejected Ripley's offer because she "didn't want Cy becoming a joke." Neither the seller nor the buyer said anything about the exact amount of money given for Cy's remains. Ohhhhh. How very sad. That pour little soul is in a better place. Imagine if it had lived. that really sad i wonder what happened to it and how it died? I dunno, I guess having no nose didn't help?